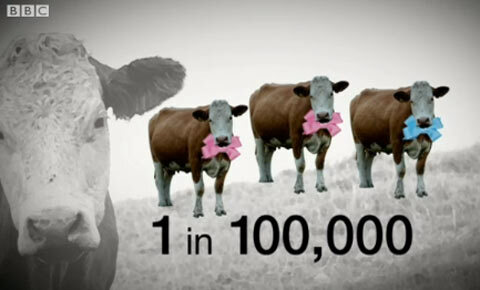 The likelihood of a cow having triplets is one in 100,000. Then there's the fact that these are different-breed triplets. There’s crazy, and then there’s crazy. An indecisive cow from a farm in Lincolnshire, England has given birth to triplets, each of which is a different breed. Modern Farmer notes that “Multiple births are rare enough in cows as it is; it varies by breed of cow, but generally the likelihood of a cow having twins is somewhere between 1 and 7%, not much more than the likelihood in humans (around 3 to 4%).” And triplets are exponentially more rare—we’re talking odds of 100,000 to one. This is like a grab bag of cute baby cows. We want.